Zhou Enlai’s first tour of Africa, popularly known as Zhou’s “Safari,” was a series of state visits to ten independent African countries, undertaken between December 1963 and February 1964 by the Chinese Premier. These visits, which occurred during a period when many countries were gaining independence from colonial power, marked the first time any high-ranking Chinese Communist leader had traveled to Africa. Zhou’s original plan was to visit every country on the continent that had established formal diplomatic relations with Beijing. He traveled at the head of a delegation of more than fifty people, including China’s foreign minister, Chen Yi. 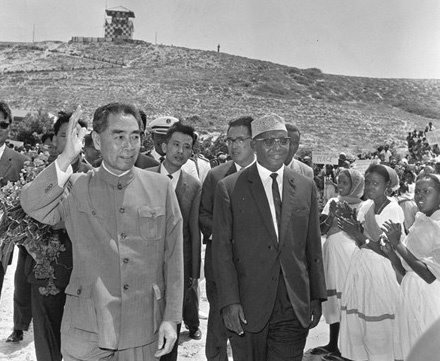 The delegation began its tour in Egypt, which in May 1956 had become the first African country to recognize the Communist government of China. During the journey, the itinerary was amended several times to add Tunisia, whose government planned to recognize Communist China; remove Tanganyika, which was in the midst of the Zanzibar Revolution; and add Ethiopia, despite the fact that it did not recognize the Beijing regime until 1970. In the end, the ten countries visited were as follows: Egypt (The United Arab Republic: December 14–21, 1963), Algeria (December 21–27), Morocco (December 27–30), Tunisia (January 9–10, 1964), Ghana (January 11–16), Mali (January 16–21), Guinea (January 21–26), Sudan (January 27–30), Ethiopia (January 30–February 1), and Somalia (February 1–4). Zhou’s primary goal in Africa was to raise China’s profile on the continent at a time when it was beginning to challenge the Soviet Union openly over the direction of the global Communist movement. While Zhou received a warm reception in countries with left-wing governments, such as Algeria and Mali, he faced more hostile encounters with leaders who were adamantly anti-communist, especially in Tunisia and Ethiopia. Another important goal of Zhou’s trip to Africa was to drum up enthusiasm for holding a second Asian–African Conference in Algiers in 1965, a decade after the first Asian–African Conference had been held in Bandung, Indonesia. Zhou was especially concerned to ensure that the Soviet Union not be invited to send a delegation to the conference, since it would make it more difficult for the Chinese government to present itself as the only truly anti-imperialist Marxist power. Zhou made a second, shorter trip to Africa in June 1965 to lobby several African leaders to support his vision for the second Asian–African Conference, but the conference was canceled soon thereafter in the wake of the overthrow of Algerian President Ahmed Ben Bella. W.A.C. Adie, “Chou En-lai on Safari,” The China Quarterly 18 (1964): 174–194; Chen Dunde, Zhou Enlai feiwang feizhou [Zhou Enlai flies to Africa] (Beijing: Jiefangjun wenyi chubanshe, 2005); Bruce Larkin, China and Africa, 1949–1970: The Foreign Policy of the People’s Republic of China (Berkeley, CA: University of California Press, 1971); Zhou enlai nianpu [A chronological biography of Zhou Enlai] (Beijing: Renmin chubanshe, 1989), vol. 2.